Do you want to sell a house fast for cash in Atlanta Georgia? We get it, you’re skeptical. Who the heck pays cash for houses? We’ve been buying houses for cash for years in the Georgia area. We are the top We Buy Houses Atlanta company and we have helped dozens of people get out of their burdensome properties. If you are looking sell your house for cash, you need to sell your house fast, you need to sell without paying Georgia Realtor fees, and you want to close on the date of your choice then read the rest of this article to learn about our local home buying program here at Breyer Home Buyers and how it works. Here at Breyer Home Buyers, we’re an established home buying company based in Georgia. If you’d rather connect with us over the phone and talk about our local We Buy Houses Atlanta, Georgia program, give us a call! You can reach us at (770) 744-0724. You have a few options when you’re trying to sell your house quickly here in our local Atlanta market. You can sell the house yourself without a real estate agent, list it with a Realtor in Georgia, or sell it to a reputable professional home buyer like Breyer Home Buyers. Here are a few of the advantages of working with a local Georgia professional home buying service. Convenience of the sale – Our company will buy your house “as is”, meaning you will not need to spend more money for repairs, you won’t need to fix it up, or worry about making it “pretty” for a showing. Putting more money in your pocket at the end of the sell is the beauty of selling your house as is for cash. The sale will be on the timeline you pick (we can close in as little as 14 days) and have cash in your hand immediately. You won’t have to pay out Atlanta real estate agent fees and commissions after you sell your property. We are not Realtors. The offer you get it what you get to keep when you sell a house for cash in Atlanta through us. 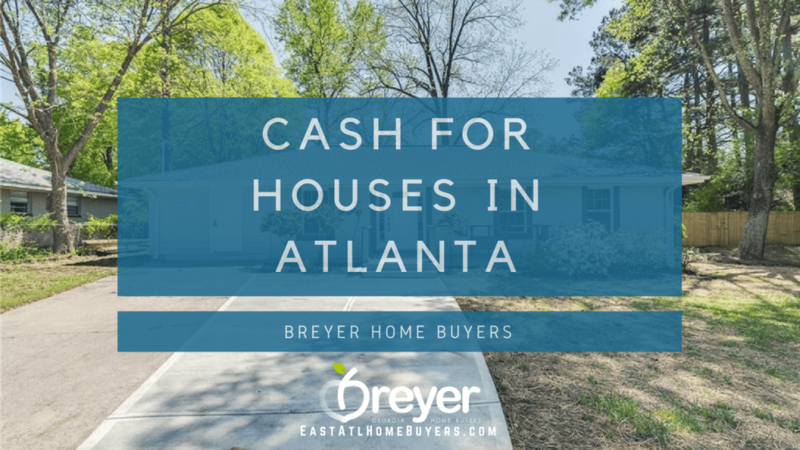 Avoid traditional buyer loan complications – When you sell a house for cash in Atlanta through our “cash for houses” program, you avoid the complications that come with a traditional home buyers loan application. Your buyer may not get the loan approval when it was anticipated or they may change their mind altogether. Since Breyer Home Buyers and our local partners use our own cash to buy houses, we can close quickly and aren’t at the mercy of banks. This means a faster closing with less hassle than going the traditional route. Speed of the sale – In many occasions, when we work with local homeowners who need to sell a house for cash in Atlanta, they don’t have the luxury of waiting 6+ months to sell. It may be foreclosure, financial difficulty, divorce, inherited property, or even bankruptcy to cause sellers to look for a way to sell your house quickly that will alleviate these problems. Once you accept the cash offer, we can close on the timeline that you want. Atlanta area homeowners work with us for many reasons including convenience, speed and less hassle than the traditional “list it with a local real estate agent” route. 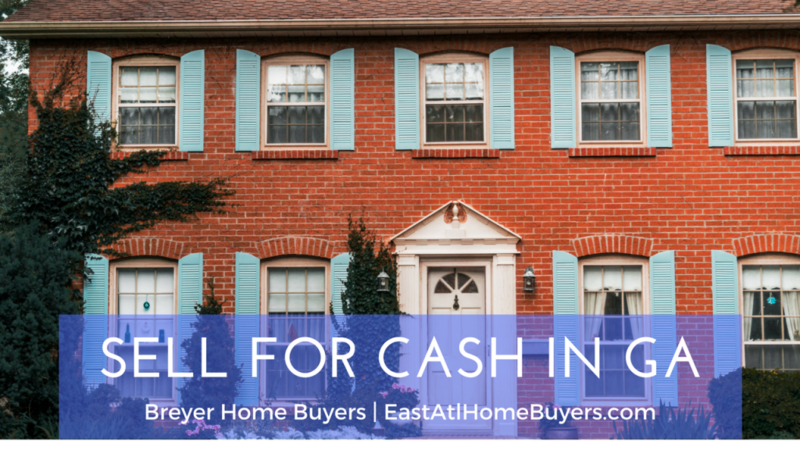 For more information on how you can sell your house quickly for cash in Atlanta Georgia, call us today at (770) 744-0724 and one of our local representatives will assist you with a cash offer at hand or you can simply fill out our online form and we shall get back to you promptly.